Left: note the branched holdfast, the somewhat flat stipe, and the puckered texture. Photo by Jenn Burt. Right: photo by Helen McConnell. 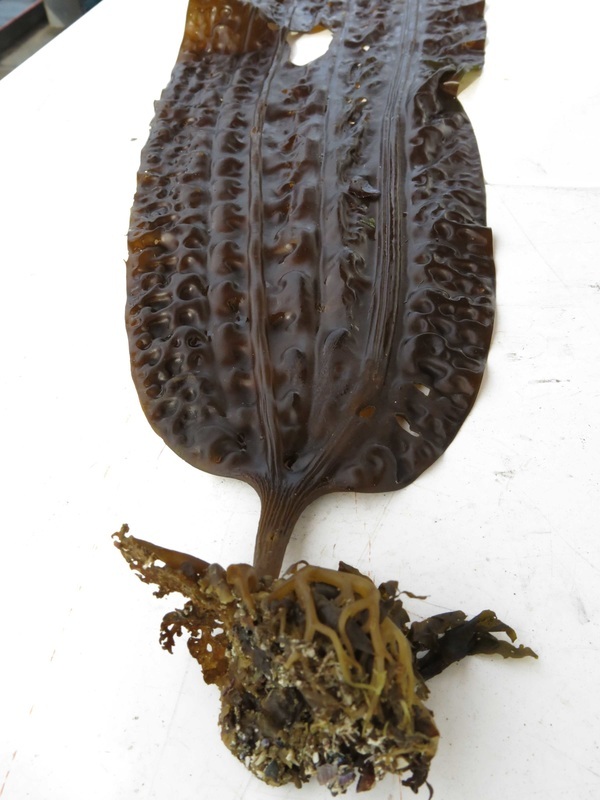 Five-ribbed kelp is an annual brown kelp with a single large light to chocolate brown blade. The elliptical blade has a puckered, wrinkled texture, and gets up to 2 m long and 35 cm wide. As the name suggests, five-ribbed kelp has five parallel ribs running from the stipe to the blade tip; three of these ribs project to one side and two project to the other, though evidence of all five is visible on each side as ribs on one side cause indentations on the other. The blade is connected to a branched holdfast (haptera) via a somewhat flattened stipe approximately 10 cm long. Five-ribbed kelp grows in the low to high intertidal zones of semi-exposed to semi-protected shores. It ranges from Alaska to southern California, as well as along coastlines of Russia and northern Japan. 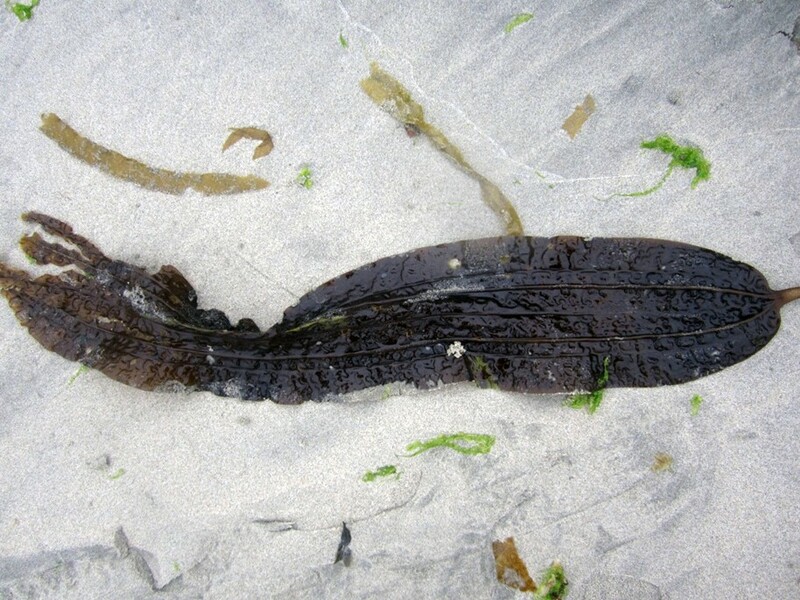 This species is distinguished from three-ribbed kelp (Cymathere triplicata) by having 5 rather than 3 ribs. Three-ribbed kelp also tends to be longer and thinner, with the ribs grouped in the centre of the blade rather than evenly spaced as in five-ribbed kelp. The blade can vary in shape according to the type and strength of wave action of the surrounding habitat. Specimens growing in more exposed locations have narrower and thicker blades than those in more protected areas (photo: wider blade). Sea urchins are predominant grazers on this species. Lindberg, M. and Lindstrom, S. (2010). Costaria costata. Seaweeds of Alaska. Accessed 01/12/2014. O'Clair, R. and Lindstrom, S. Costaria costata (Turner) Saunders. In Klinkenberg, Brian. (Ed.). E-Flora BC: Electronic Atlas of the Plants of British Columbia. Lab for Advanced Spatial Analysis, Department of Geography, University of British Columbia, Vancouver. Accessed 01/12/2014. Kelly Fretwell, Gillian Harvey, and Brian Starzomski (2014).